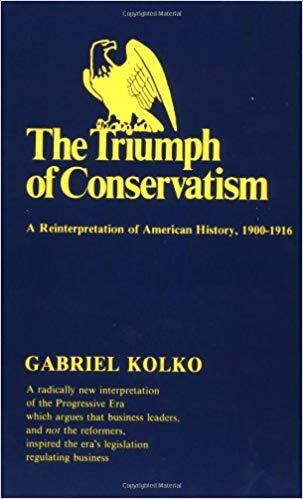 Gabriel Kolko's "The Triumph of Conservatism: A Reinterpretation of American History 1900–1916"
Reading Gabriel Kolko’s classic The Triumph of Conservatism: A Reinterpretation of American History 1900–1916 (1963). A far more profound book than the vast majority of scholarship on the Progressive Era. Except in the beginning he does the typical historian thing of arguing that the triumph of conservatism “was the result not of any impersonal, mechanistic necessity but of the conscious needs and decisions of specific men and institutions.” I.e., things could have turned out differently. But the mere fact that developments were the product of men and institutions doesn’t mean there were no impersonal pressures that strongly constrained what would happen. Anyway, “progressivism was initially a movement for the political rationalization of business and industrial concerns, a movement that operated on the assumption that the general welfare of the community could be best served by satisfying the concrete needs of business. But the regulation itself was invariably controlled by leaders of the regulated industry, and directed toward ends they deemed acceptable or desirable.” Business control over politics (and not political regulation of the economy) is “the significant phenomenon of the Progressive Era”—and, he might have said, of every other era since before the Civil War. So big business desired federal regulation, in large part to reduce destructive competition between firms. “Ironically, contrary to the consensus of historians, it was not the existence of monopoly that caused the federal government to intervene in the economy, but the lack of it.” Business by its own voluntary measures, such as mergers, hadn’t succeeded in rationalizing the economy. Its leaders realized that only the national government could accomplish that purpose. Another reason for federal regulation was that, in its conservatism, it could be a “bulwark against state regulations that were either haphazard or, what is more important, far more responsible to more radical, genuinely progressive local communities. National progressivism, then, becomes the defense of business against the democratic ferment that was nascent in the states.” An ironic and original thesis, in light of the conventional wisdom that federal legislation usually has a more progressive thrust than state legislation. Despite the merger movement between 1897 and 1901, “the first decades of the century were years of intense and growing competition.” Giant corporations often didn’t even do very well, making mediocre profits. A financial journal observed in 1900 that “the most serious problem that confronts trust combinations today is competition from independent sources… In iron and steel, in paper and in constructive processes of large magnitude the sources of production are being multiplied, with a resultant decrease in profits…” Kolko proceeds to show in a series of “case studies” (of particular industries) that competition in the early years of the new century was growing: in iron and steel, oil, automobiles, agricultural machinery, copper, meatpaking, and the telephone industry. (Also paper, textiles, glass, chemicals, insurance, etc.) The public outcry over “monopolies” wasn’t wholly without cause, but it was essentially confused. It was similar with the Pure Food and Drug Act, passed the same year. Major food interests had lobbied for regulation “in order to set their own houses in order and protect themselves from more unscrupulous associates,” and they supported the bill. In short, what was desired was ever greater fusion of business with government, in the formally fascist fashion that was already becoming the norm across the Western world (and would eventuate in Fascism and Nazism, and more generally in numerous varieties of state capitalism). The banking reform movement that culminated in passage of the Federal Reserve Act was, of course, organized by bankers and served their interests. As Kolko says, it “was initiated and sustained by big bankers seeking to offset, through political means, the diffusion and decentralization within banking”—the competition of innumerable state banks and smaller banks around the country, and the relative decline of New York as the center of finance. There was also growing financial instability, which culminated in the panic of 1907. The Federal Reserve System was the solution. “The trend in the national banking system until 1913 was toward a reduction in the bankers’ balances and individual deposits in New York, and in favor of the relatively more rapid growth in the Midwest and West… The Federal Reserve System, for the most part, stabilized the financial power of New York within the economy, reversing the longer term trend toward decentralization by the utilization of political means of control over the central money market.” Thus, another quintessentially “Progressive” achievement was quite conservative in its aims and consequences. Historians have continually tried to explain the seemingly sudden collapse of progressivism after the First World War, and have offered reasons that varied from moral exhaustion to the repression of nonconformity. On the whole, all explanations suffer because they really fail to examine progressivism beyond the favorable conventional interpretation. Progressive goals, on the concrete, legislative level, were articulated by various business interests. These goals were, for the most part, achieved, and no one formulated others that big business was also interested in attaining. Yet a synthesis of business and politics on the federal level was created during the war, in various administrative and emergency agencies, that continued throughout following decade. Indeed, the war period represents the triumph of business in the most emphatic manner possible. With the exception of a brief interlude in the history of the Federal Trade Commission, big business gained total support from the various regulatory agencies and the Executive. It was during the war that effective, working oligopoly and price and market agreements became operational in the dominant sectors of the American economy. The rapid diffusion of power in the economy and relatively easy entry virtually ceased. Despite the cessation of important new legislative enactments, the unity of business and the federal government continued throughout the 1920's and thereafter, using the foundations laid in the Progressive Era to stabilize and consolidate conditions within various industries. And, on the same progressive foundations and exploiting the experience with the war agencies, Herbert Hoover and Franklin Roosevelt later formulated programs for saving American capitalism. The principle of utilizing the federal government to stabilize the economy, established in the context of modem industrialism during the Progressive Era, became the basis of political capitalism in its many later ramifications. I like Thorstein Veblen’s remark that the U.S. Congress is little more than a “Soviet of Business Men’s Delegates.” Exactly! * We see, once again, that, contrary to panegyrics penned by the public relations industry, what business really wants isn’t a “free” market but a controlled market. That can be thought of as one of the central points of Kolko’s book. The hatred of the market is so extreme that some businessmen, for instance Andrew Carnegie and Elbert H. Gary (head of U.S. Steel), have actually advocated government price-fixing! Progressivism was initially a movement for the political rationalization of business and industrial concerns, a movement that operated on the assumption that the general welfare of the community could be best served by satisfying the concrete needs of business.